The Historic Sites Association of Newfoundland and Labrador has chosen the [HERE]SAY Story Map of Water Street as a winner of the 2011 Manning Award for Excellence in the Public Presentation of Historic Places. The Manning Award was created to recognize community heritage projects and the dedication and work of champions of heritage. It is named for the late Bill Manning, a former Parks Canada Superintendent of Newfoundland and Labrador National Historic Sites. Manning realized that the preservation and presentation of our heritage requires the involvement of people in the community. The [HERE]SAY Story Map of Water Street demonstrates that a landscape consists not only of streets and buildings, but of human experience -- and this is what makes up the unique character of the city. Strollers on Water Street can find [HERE]SAY signs on 26 light poles. Each sign displays a phone number and a 3-digit code. 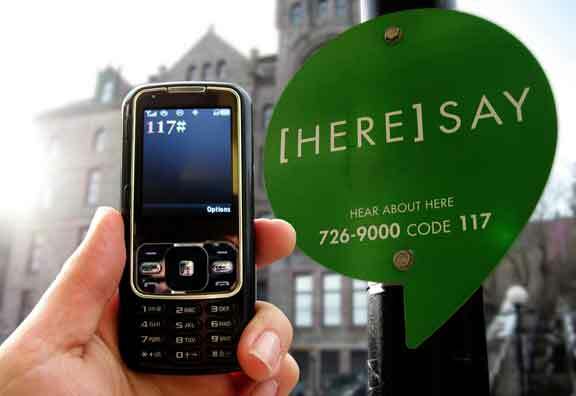 Pedestrians can dial the number on their mobile phone, punch in the code, and hear a story about the very spot where they are standing. Receiving this award is a recognition of the more than forty St. John’s residents who contributed their personal Water Street memories to the project. Bored by storyboards and polished plaques full of names and dates and “important” facts? In Torbay heritage isn’t something you see, it’s something you shape. Join the conversation as the Torbay Museum launches its newest digital oral history memory project. Residents and visitors can now grab their cell phones and start exploring the Town of Torbay. Discover each of the five Sheritage sites. Find the phone number and code that unlocks a local story told by a local voice. Call, consider and then... comment. What are the ingredients of a shared heritage? Can remembering bring us closer together? Are some things best left in the past? Is there room for imagination? Should history include a good laugh? Congratulations to the Torbay residents and museum staff who contributed their stories, recollections and energies to the SHERITAGE project. In cooperation with the Outer Battery Neighbourhood Association, [HERE]SAY signs have been erected along Outer Battery Road. The area, leading to the North Head Trail, sees 84,000 pedestrian visitors annually. At each sign, walkers can hear personal memories told by community residents. The stories were collected by researchers Annie McEwen and Lisa Wilson as part of a 2011 summer project of the Outer Battery Neighbourhood Association. Thanks to all the Outer Battery residents who contributed their stories and recollections for this new project.